Foliar spraying is a true and tested way to increase yields and prevent issues in plant culture. Both soil and hydroponic growers have used foliar fertilizer applications to increase yields and prevent problems due to nutrient deficiencies during the past 50 years. However there is a lot of mystery and confusion surrounding foliar fertilizer applications, reason why this technique is often applied incorrectly or sub-optimally. Today I want to talk about 5 key pieces of information to consider when doing foliar fertilization so that you can be more successful when applying it to improve your crop results and reduce deficiency problems. 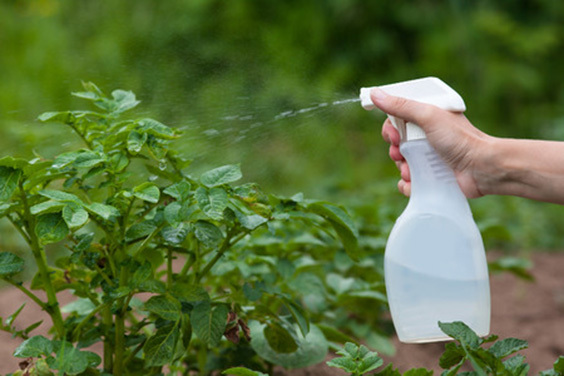 If you want to learn more about these factors I suggest you read the following reviews on foliar feeding (here, here and here). Second table in this post was taken from this study on wheat. Foliar fertilization is not root fertilization. A usual problem when doing foliar fertilization is to think that the same products can be used for leaves and roots. When you want to increase your crop yields using foliar fertilization you should definitely not use the same products and concentrations you use for soil. There are for example some chemical substances that you would never want to apply to the roots that have actually shown to give better outcomes in leaves. A good example is calcium chloride which is a huge mistake in root fertilizers but a great choice when doing foliar fertilization. 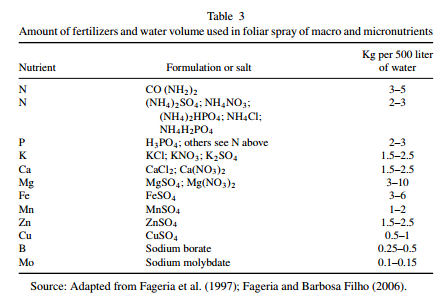 Foliar fertilizers should generally be much more concentrated. When people apply foliar fertilization they usually apply much lower concentrations because they are afraid of burning leaves. Although this can certainly happen if the foliar fertilizer is badly designed research has shown that the best results are obtained with much higher concentrations than what you generally use for the roots. For example when you apply an iron foliar fertilization regime you generally use a concentration of 500-1200 ppm of Fe while in root applications you only very rarely go beyond 4-5 (most commonly 1-3 ppm). Usually concentrations in foliar fertilizers will be much higher and if the fertilizer is correctly designed this will give much better results. The graph below (taken from the first review linked above), shows some of the most commonly used fertilizer concentrations. Surfactants are very important (don't use dish washing soap!). Leaf coverage is very important in foliar applications because you want the fertilizer to be evenly spread across the entire leaf not "clumped" into drops due to surface tension. Many people have trouble with nutrient burn due to bad fertilizer design that causes inadequate leaf coverage. However all surfactants are not created equal and ionic fertilizers are very undesirable for this task due to their interaction with leaf tissue and fertilizers. Due to this reason you should NOT use something like dish washer liquid soap but a proper non-ionic surfactant like a polysorbate. The surfactant will be a very important part of your foliar fertilizer formulation. Timing is also critical. The time when you do your foliar sprays applications is also very important for optimal results. In general you want the leaf stomata to be open and the vapor pressure deficit to be lower so the best time to do foliar spraying is usually during the afternoon after temperatures have dropped significantly. For most time zones this usually means sometime after 3PM. Doing foliar applications sooner can lead to much larger stress due to a higher vapor pressure deficit - risking burns as well - while doing it later leads to less efficient absorption due to the stomata being closed. If applying the spray at this time is not possible then early morning often works as well. Make sure you measure your daily temperature/humidity fluctuations to ensure you don't do foliar sprays at a high VPD. Couple adequate additives for yield increases. Research has shown that while nutrient foliar spraying can enhance yields significantly under sub-optimal root feeding conditions if the root concentrations are already optimal - as in a well managed hydroponic crop - it is hard for simple nutrient foliar spraying to provide a lot of benefit. However there are several biostimulants that are poorly absorbed through the root zone that can give you much better results when used as foliar sprays. Additives like salicylic acid and triacontanol can make sure that your nutrient foliar spray gives you maximum additional benefits. As you can see there is a lot to the design of an adequate foliar spray. You must consider that the substances you use need to be fit to the purpose - not necessarily the same as for root applications! - and that your concentrations, surfactants, additives and application times are adequate. Now that you are aware of these factors you should take them into account when designing your next round of foliar spraying for your crops.